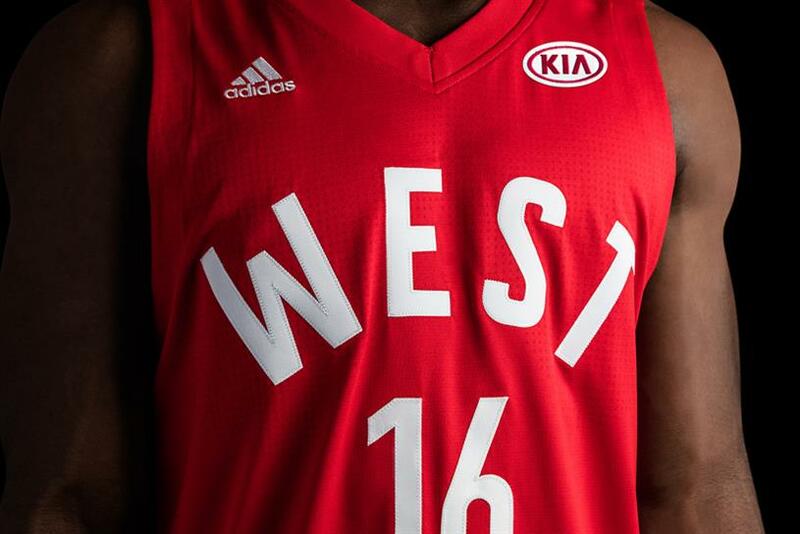 Kia's tiny logo for All-Star Game uniforms breaks in a potential new blockbuster space for advertisers. Fans may have noticed a change on the court at the 2016 NBA All-Star game on Sunday. On every player’s shoulder, a 2.5-inch-by-2.5-inch patch bore the logo of the automaker Kia. It’s a small change with big implications. Currently, none of the four largest American sports leagues allow advertisements on team jerseys during games — not baseball, basketball, football or hockey. But the NBA is considering changing its policy, and if it does it could mean a permanent shift in the look of US sports and the branding opportunities it provides. Owners discussed the issue at a meeting also held on Sunday, ahead of an April Board of Governors meeting that will likely determine the league’s decision. Under a tentative proposal, each team would have a year to find a single brand sponsor that will be able to place their message on the left chest of a team’s jerseys. Deals can last up to three years. The teams keep half the proceeds, while the other half goes to the league to be divvied up among the other teams, a revenue-sharing scheme meant to prevent popular teams from gaining too much of a financial advantage over smaller markets. "There’s an opportunity to do something different," said Bruno Frankel, a strategist at Mother New York who helped lead the agency team that rebranded the Philadelphia 76ers in 2014. "I would be saying to a brand, what can you do with that space that isn’t just sticking your logo on there?" It’s an interesting problem, what to put in a 6.25-square-inch box. Surely, many brands will just use their own logo, but perhaps the specifics won’t matter so much. "It doesn’t really tell you a story about the brand," Frankel added. "It’s a pure awareness play in that regard, and it makes a brand seem big and credible." The Women’s NBA began allowing jersey ads back in 2009, and ads began to appear on the sidelines in 2013. Last year, Kia struck a deal with the league to put the small logos on the All-Star jerseys for both the 2016 and 2017 games. It was an easy decision, according to Kia. "All eyes are on the players during the game, and that meant all eyes were going to be seeing Kia constantly during the game, which makes us part of the conversation surrounding one of the league’s premier events," said Tim Chaney, vice president of marketing communications at Kia Motors America. Now that more details of the deal have emerged, it looks like a dry run for the NBA. In 2014, then-NBA commissioner Adam Silver called jersey logos "inevitable" and suggested they could be worth a total of $100 million. If the change is approved, bidding wars should drive that total even higher, much like the inflated prices brands now pay for naming rights for stadiums. One open question that will go a long way in determining the popularity of the move is whether the retail jersey will change, too. Currently, the jerseys NBA players wear during games are made by Adidas. Only the team info and player’s name appear on those jerseys (the All-Star Game is an exception), but fans who buy jerseys in stores or online get a version with the Adidas logo. Now the league is planning to switch its supplier to Nike, which has been lobbying to place its logo on the regular game jerseys as well, a branding coup. But since game and retail jerseys are already different, there’s no way to know if the jerseys for fans would also come with sponsor logos. Nike declined to comment for this story. It’s an important point, since jersey sales generate nearly $1 billion in annual revenue for the NBA, so if fans are disappointed, it could cost the league. "I do think in the early year or years it’s going to have a bit of a negative effect," Frankel said. "Whether or nor that will be enough to hurt the bottom line of a particular sports team, I’m not sure. I imagine the sponsorship is going to cover that loss anyway." Unlike many global sports brands, American teams don’t redesign their look very often. Fans are notorious for preferring older style apparel like "throwback" jerseys, and they are resistant to changes that differ from what they grew up with. When the Washington Bullets changed their name to the Wizards, it took 14 years for fans to begin to embrace the new logo and name, and then only after a new redesign. "It’s going to be definitely a shock, and there’s no doubt that there will be a lot of backlash against it," Frankel said. "Fans will hate it and commentators will speak out against it." Kia thinks that’s a risk worth taking. "NBA fans are progressive, just like the league. They are intelligent. They are passionate," Chaney said. "And if that passion results in a little bit of debate about this, that’s okay." In the end, fans usually care more about a team’s performance on the court than almost anything else — NFL scandals have proven that athletic success can cancel out any other considerations. So if teams make it clear that the extra revenue from ad deals is going toward fan service — recruiting better players, building better facilities, raising the salary cap — rather than simply lining the pockets of owners, then they’ll support it.